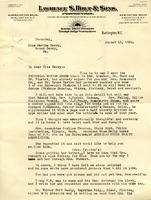 The letter offers Martha Berry some woolen cloth that may be suitable for women's clothing and asks Martha Berry if she can use it. 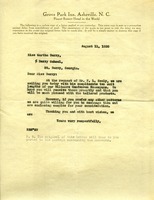 Seely asks that Martha Berry not disclose the donor of the cloth. 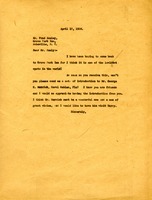 Martha Berry thanks Mr. Seely for some homespun material that she will use to make a suit and will do her best to advertise his product. Berry thanks Mr. Seely for entertaining her teachers during a recent trip they made to the Grove Park Inn. Miss Berry says that the Schools will be ready for the three deer that Mr Seely is sending. Miss Berry thanks Mr. Seely for allowing some Berry teachers to spend a few days at his hotel. She says she will try to have someone come up by July 10th. 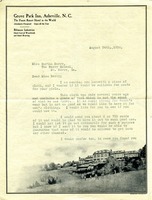 Letter to Martha Berry from the Grove Park Inn. 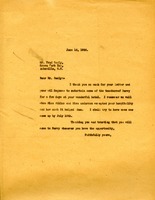 In this letter the Grove Park Inn sends Martha Berry two suits from their Biltmore Handwoven Homespuns collection. 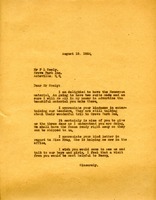 Martha Berry expresses interest in returning to the Grove Park Inn, and requests an introduction to Mr. George Merrick of Coral Gables Florida.